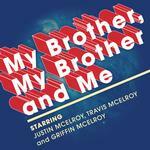 My Brother, My Brother And Me: MBMBaM 377: Face 2 Face: One Great Potato! Here's our most recent live show from the Tennessee Performing Arts Center in beautiful Nashville, TN! It features a new, fresh take on audience questions, and probably the greatest Haunted Doll Watch of all time. I'm officially tired of live episodes. Prerecorded heaven now. ME TOO. I quit listening to the live ones completely a couple of years ago because I never enjoy them. I’m worried about this trend. this was a good episode though? like yeah justin was a little too drunk but that led to an amazing haunted doll watch and overall the goofs were good. the dueling audience questions show that the brothers have been listening to criticism and it basically solved the problem of people telling anecdotes instead of asking questions. there’s no “trend,” they’re doing a tour and releasing the episodes. if they went unrecorded people would complain, if they put them behind the donor wall people would complain, if they release them all people complain. I just kind of wish they wouldn't do so many live shows at all if they're going to interfere this much with the show I like. But I know people love them and I want to boys to get money. So I'm conflicted. I guess I have to side with the thing that gets them money and raises their profile so they can do more cool stuff. I thought the dueling questions thing was a good idea which was obvious by how many sort-of funny anecdotal non-questions they still got. And even saying "No bummers" they still got a bummer at the end (the burglary one). Maybe I'd like the live episodes more if there were no audience questions, either no audience participation at all or maybe some different way for them to participate. I also kind of wish the live shows were more like the regular shows in that in those they don't sound like they're performing in their voices. That's why it's one of the only podcasts I can stand listening to at all. I don't think they meant to release quite so many live shows all at once. Usually they only release a live show immediately after a touring weekend, and if there's extras they'll save them for a while. But the touring weekends being closer together, Travis moving, Griffin getting sick, etc messed up their schedule quite a bit. I'm ready to be done with live episodes but this was one of the better ones. And yes, my God, the new question-asking format is so, so much better. It felt like the last live episode question askers were people who just wanted a mic to tell their Really Good Story and it was pretty painful. This kept the energy up and provided a good platform for the boys to launch their goofs. I really enjoyed Justin's observation that the fridge is like a hospice for food that guides it into its final stage. I was at this show, and I enjoyed it a lot. If you have a chance to see the boys live, I would recommend it. The energy of being in an auditorium full of the special kinda of weirdos (SO MANY shrimp heaven now shirts) was really exciting. So I was listening to this as I was getting ready for bed, as I often do. You know, face washing, tooth brushing, etc. During the haunted doll watch, I had a mouthful of mouthwash. Seconds into Justin emulating the buck wild capitalization situation, my mouthful of mouthwash was forcibly relocated onto my bathroom mirror. Thus followed a very undignified sort of laughing situation with the mouthwash and the burning and the tears of lolz. Oh thank Christ they are putting their foot down on office drama, middle class problems are never not boring as hell. Oh wow. I was at this show. My cheeks hurt from laughing at the end of the night. And my other cheeks hurt from being a large man trapped in a small theatre seat. I've always liked the way that the Flop House guys give a warning/pre-chiding before their audience question sessions at live shows, where they basically say - if you were not you, would you be annoyed by being forced to listen to your question? Then for the love of god, don't ask it. Seems like the MBMBAM guys might have decided to do a more gentle version of the same thing (in keeping with The Brand). Yeah, I am pleased that they're finally doing something about questions which are really anecdotes. The smart money would be for them to do what Jordan Jesse Go does with its live shows, where they ask the audience to share "momentous occasions": They make them write out a quick summary ahead of time and select their favorites. Might be a bit of a chore depending on how many questions they get though, and it would mean losing that surprise factor of springing a bonkers situation on the brothers. You guys make me feel so much better about my reaction to the audience questions. I'd been toying with just skipping those part of the live shows, but the pre-duel before answering is actually pretty good.